Sanferminak gertu baino gertuago ditugu, suzirien bolbora usaina antzeman daiteke eta Alde Zaharreko galtzada-harriak festazaleen eta zezenen energiari eusteko prestatzen hasi dira. Itsasoz bestalde ere hasi dira Sanferminetako gogoa pizten eta , aurki, Iruñean ingelesa besterik ez dugu entzungo. “For the first in our series of assignments looking at adventure-filled destinations around the world, we take a look at the little town of Pamplona, which begins its Fiesta de San Fermin on July 6 each year”. Iruñea: Abentura eta festa bila dabiltzan estatubatuarren topagunea, hala dio bidaiei buruzko CNNko erreportaje batek. Eta hala, urtero tropelean datoz Iruñeara zezenaren adarren aurrean beren ausardia probatzera. Zaila da Sanferminak ezagutzen ez dituen estatubatuar batekin topo egitea. 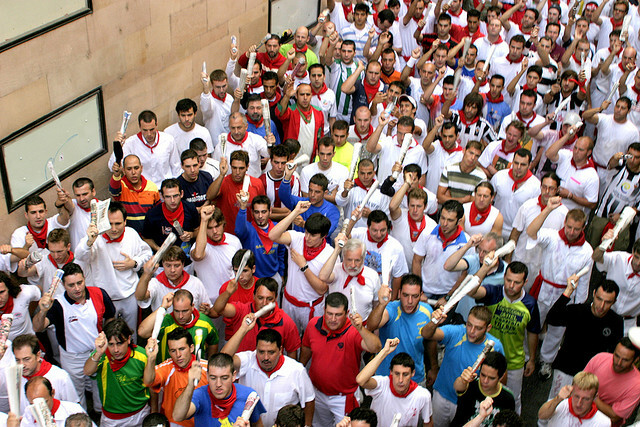 “Have you ever visited Pamplona, and did you go to this fast-paced fiesta? Share photos of what you saw and did during your trip. Tell us all about the experiences you had, the food you ate and how you felt about the festivities. The best photos and tips could be featured in our Destination Adventure special”. Atzerritarrek erraztasun eta gogo ikaragarria erakusten dute pasaportea eskuan hartuta festaz festa joateko. Guri, aldiz, kosta egiten zaigula dirudi; hemengo festak aski onak direlako agian? Ea, zein festaz gozatzeko joan zarete atzerrira azken aldian?